Every Yoga session at The Cedar Tree provides a nurturing environment, with each lesson structured to allow you to step into yourself and take a journey that will resonate after your session has finished. While respecting your uniqueness your instructor will delve into an eclectic mix of postures (Asana), breathing (Pranayama), meditation, music, poetry, aroma (essential oils, mists), blankets, eye pillows, tinga chimes and singing bowls to help make your practice special. 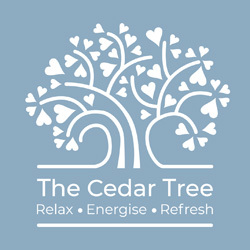 The Cedar Tree is with you to guide you, giving you options, opening up new perspectives, allowing you to STOP–BREATHE–CONNECT with your mind, body and spirit. Over time you will find barriers that have held you stuck in a certain place, either physically or mentally, will start to crumble, you will grow lighter and taller finding strength from new foundations. You can experience Yoga at The Cedar Tree on an Individual basis, in a small group or join one of our classes. One to one yoga…A personal approach to the practice, while all of our classes are very relaxed and friendly we appreciate that sometimes individual tuition suits some people more than a group environment. The one to one option can also extend to up to 4 people, so if you have a group of friends that would like to practice together, you can choose your own time and day. Treat yourself to some time out on one of our regular extended yoga experiences 10-12.30 am only £20. The session begins with 90 minutes of relaxing yoga followed by a meditation, visualisation or yoga Nidra (yoga sleep)then rolls into a wonderful sound healing. These sessions are very popular, so to avoid disappointment early booking is advised.